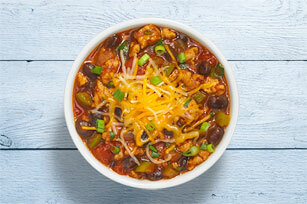 How happy will you be one hectic weeknight when you remember that you made this Make-Ahead Smoky Chipotle Chicken Chili? Our prediction: very happy! Cook and stir first 3 ingredients in large nonstick skillet on high heat 8 to 10 min. or until chicken is done. Add tomatoes, beans, green peppers, barbecue sauce, chili powder and chipotle chile pepper powder; mix well. Bring to boil; simmer on medium-low heat 25 min., stirring occasionally. Cool completely. Spoon chili into freezer container; freeze up to 1 month. Thaw chili in refrigerator overnight. When ready to serve, bring to boil in saucepan, then simmer on medium-low heat 10 to 15 min. or until heated through, stirring occasionally. Stir in cilantro just before serving. Top with cheese and green onions. Prepare using your favorite flavor of BULL'S-EYE Barbecue Sauce, such as Texas Style. To speed up the time it takes to cool the cooked chili before freezing, spread it onto a chilled rimmed baking sheet. Let stand at room temperature until cooled to room temperature. Serve topped with BREAKSTONE'S or KNUDSEN Sour Cream.